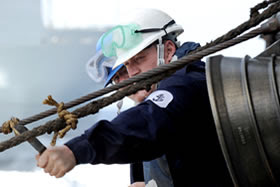 The maritime industry is looking for dedicated hardworking people. Even if you don’t have an overwhelming love of the ocean, you can still find a career to your liking that deals with water. Find out about the jobs available to you. Do you have a degree in engineering? The shipping industry wouldn’t be what it is without the main component-ships. Each year, cruise lines add several ships to their fleets to attract more passengers and garner a significant corner of the market. Someone has to build those ships. Engineers and construction workers are some of the people hired to do the job. Building a new ship involves design specifications, building models, and outfitting the ships with the latest technologically advanced equipment. Our oceans are a new source of energy and resources. These waters need to be explored to learn more about its delicate ecosystem. That is where marine biologists come into the picture. Scientists are an important part of the maritime industry. They work to keep sea life from being adversely affected by sea travel and find ways for the maritime industry to operate environment-friendly. Maritime jobs on land are involved in running shipping companies and port operations. There will be port managers who schedule the arrival and departure times of ships. They are responsible for ordering checks on cargo and to be sure that all vehicles abide by the laws that govern the port. Individual companies have shipbuilding operations and administrative duties to contend with. Qualified people are needed in these positions to keep the shipping business going. Each job in the maritime industry is governed by its own criteria. All of these positions require at least an undergraduate degree in the area of choice. Scientific and technology positions may require additional degrees to be competitive in the field. Benefits are set down by the company and pay is dependent on experienced and education. This is different with jobs on the water. Maritime code dictates the way that ships are run. You have a captain who is the judge and jury so to speak on the ship. Each person has someone to report to and that chain of command is respected. Fishing jobs are in great demand in Alaskan waters. During the summer months, salmon are the most sought after species of fish and vessels make salmon runs until the season ends. On a fishing boat, a new person will most likely start on the slime line processing the fish. Those who are interested in moving up can tell the captain of their interest in becoming a deckhand or a processing manager. Deckhands on most boats are eligible for a part of the ship’s take at the end of the season. Processors are paid by the hour and for overtime. Officers, deckhands, and the captain split the total take with the captain retaining the biggest share. As you gain experience, you can apply for higher ranking positions. On many sea vessels experience and education combine to move you up the promotion ladder. Working for a company, benefits include health care. As a summer worker on fishing vessels, you are responsible for your own health care but room and board are covered or subsidized by whoever hired you. With so much work and overtime, you stand to carry most of your pay back home at the end of the season. Cruise ship lines offer great benefits and perks to their employees. Pay increases with the job and experience. Concessionaire companies also hire for cruise ship jobs with commissions on sales and the perk of living on a ship and seeing exotic ports. Each maritime job has its own benefits and promotion tracks. Even if the pay is low at the start, the benefits and adventure of the job may make up for that.